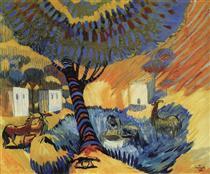 Martiros Saryan (Armenian: Մարտիրոս Սարյան; Russian: Мартиро́с Сарья́н; 28 February [O.S. 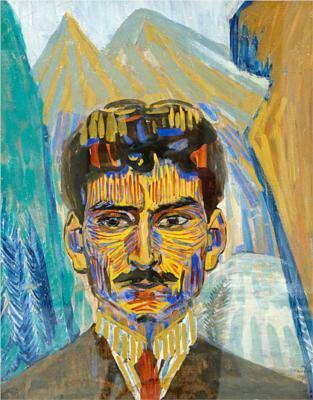 16 February] 1880 – 5 May 1972) was an Armenian painter, the founder of a modern Armenian national school of painting. He was born into an Armenian family in Nakhichevan-on-Don (now part of Rostov-on-Don, Russia). In 1895, aged 15, he completed the Nakhichevan school and from 1897 to 1904 studied at the Moscow School of Arts, including in the workshops of Valentin Serov and Konstantin Korovin. 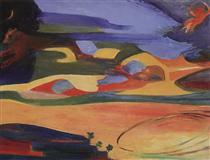 He was heavily influenced by the work of Paul Gauguin and Henri Matisse. He exhibited his works in various shows. 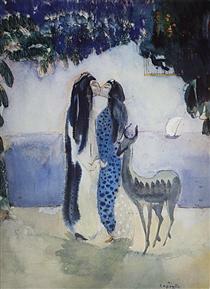 He had works shown at the Blue Rose Exhibit in Moscow. He first visited Armenia, then part of the Russian Empire, in 1901, visiting Lori, Shirak, Echmiadzin, Haghpat, Sanahin, Yerevan and Sevan. 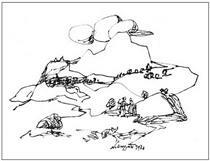 He composed his first landscapes depicting Armenia: Makravank, 1902; Aragats, 1902; Buffalo. 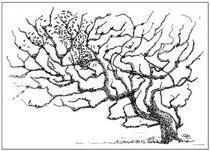 Sevan, 1903; Evening in the Garden, 1903; In the Armenian village, 1903, etc., which were highly praised in the Moscow press. From 1926–1928 he lived and worked in Paris, but most works from this period were destroyed in a fire on board the boat on which he returned to the Soviet Union. 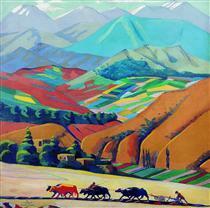 From 1928 until his death, Saryan lived in Soviet Armenia. 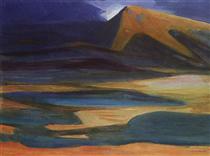 In the difficult years of the 1930s, he mainly devoted himself again to landscape painting, as well as portraits. He also was chosen as a deputy to the USSR Supreme Soviet and was awarded the Order of Lenin three times and other awards and medals. He was a member of the USSR Art Academy (1974) and Armenian Academy of Sciences (1956). 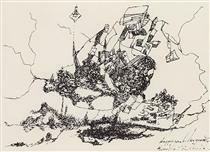 His great-granddaughter Mariam Petrosyan is also a painter, as well as cartoonist and award-winning novelist.